This is Part 4 of a four-part series about high-speed rail in California. Part 1: First Stop, Fresno. Part 2: Corn nuts and the bullet train. Part 3: Will the train be affordable?. Part 4: San Jose to San Francisco — easier said than done. Listen to the whole show: Inside High-Speed Rail. Diridon, who turned 78 last week, hopes to live long enough to ride on a high-speed train from San Francisco to Los Angeles. I meet Diridon in San Jose’s main train depot, one of the key stops on the path of high-speed rail. The station literally has his name on it. 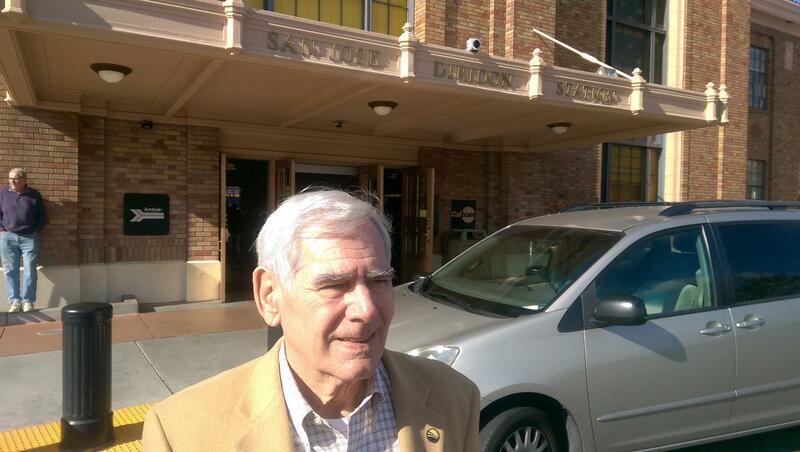 In 1994 it was named “Diridon Station” to recognize his work bringing transit to the region. Diridon has pushed for high-speed rail in California since the 1980s. In the 2000s he served on the board of the California High-Speed Rail Authority, which oversees construction of the rail system. The Rail Authority hopes to open the line from San Francisco to Los Angeles in 2029. Diridon believes the bullet train will make California a leader in energy-efficient transit. And although the project has suffered financial, logistical, and political setbacks, he urges patience. Some Californians lost their faith long ago. One of them is Elizabeth Alexis, co-founder of the citizens watchdog group Californians Advocating Responsible Rail Design. 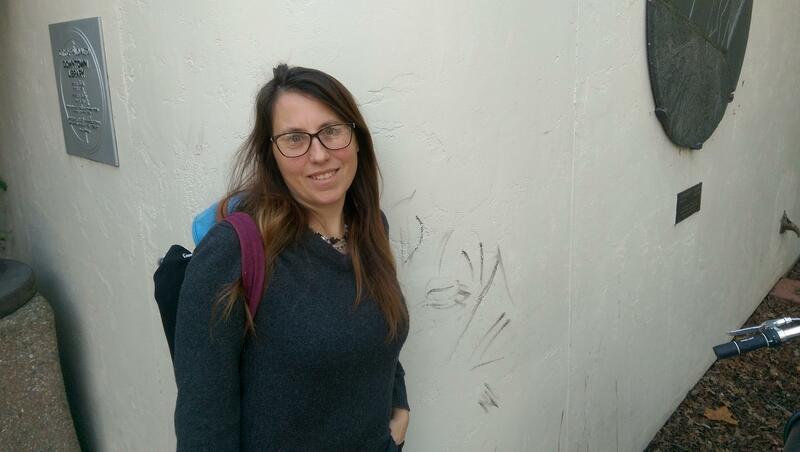 A Palo Alto resident, Alexis says she voted for the high-speed rail ballot proposition in 2008. For the corridor between San Jose and San Francisco, the High-Speed Rail Authority had originally planned to build their own tracks next to Caltrain, the commuter rail line for the San Francisco Peninsula. Now, the two systems plan to use the same set of tracks, creating a “blended system.” Passing tracks will allow the faster trains to get ahead. The High-Speed Rail Authority has agreed to pay Caltrain almost a billion dollars in exchange for using their tracks. That money will be used to help electrify the trackway. An electrified system is necessary for the high-speed trains. It also represents a long-awaited upgrade for Caltrain, which currently runs on diesel. Switching to the blended system allowed the High-Speed Rail Authority to cut its costs by roughly 13 billion dollars. Caltrain supports the plan. They will be able to increase their capacity for riders by shifting to electric-powered trains that stop and start more rapidly. As the region has grown in the past decade, Caltrain’s daily ridership has doubled. But Caltrain and the high-speed rail system will have to compromise with each other to work out schedules. Although similar mixed-use systems are common throughout the world, sharing tracks limits how much each rail service can grow in the future. The deal is in legal limbo. Opponents of high-speed rail have sued, saying that the money voters approved for high-speed rail can’t be used for Caltrain. Rod Diridon has studied blended systems around the world, and says this one will serve the needs of Caltrain and high-speed rail riders. Planners are expecting that everyday commuters going between San Jose and San Francisco will still choose Caltrain, not high-speed rail. Although final ticket prices have not been set yet, riding high-speed rail would almost certainly be more expensive than riding Caltrain. “Kind of like a very, very first class Caltrain between San Francisco and San Jose,” says Diridon. It would be a little faster. A Caltrain study estimated trips from downtown to downtown on high-speed rail would take 45 minutes, versus an hour on Caltrain. The 2008 ballot proposition that approved the high-speed rail project stated that travel times between San Francisco and San Jose “shall not exceed” 30 minutes. Jerry Cauthen, a transit advocate and mostly-retired engineer, looks out at the afternoon traffic in downtown San Francisco. He has a dim view of the state of transportation in the city. “San Francisco is becoming like Manhattan in density, and it’s got the transit system of Cincinnati,” says Cauthen. Cauthen is standing at the corner of Mission and Beale. 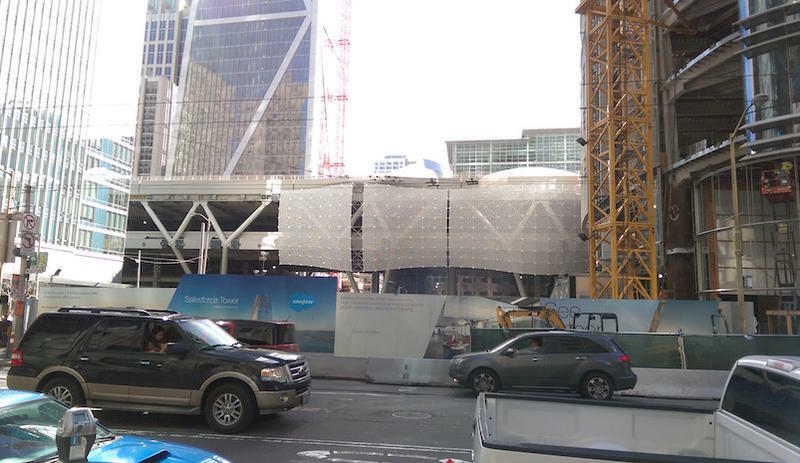 Here, the downtown San Francisco terminus for high-speed rail is under construction. The Transbay Transit Center, as it’s called, is meant to be a hub for 11 different transit systems to come together. Today, it looks like a nice parking garage, three blocks long, and three stories high. Buses will drive in off the Bay Bridge, sailing over traffic. The rooftop will feature a garden. And artist renderings show Caltrain and bullet trains arriving on an underground platform. The bus terminal part will open later this year. But the train station portion of the Transit Center has fallen behind schedule. It won’t be done until at least 2025. So when the bus terminal opens, it will be sitting on top of a cavernous construction site. Today, the northernmost Caltrain stop is at 4th St. and King, in Mission Bay. That’s 1.3 miles short of downtown San Francisco. Diridon says that San Franciscans have wanted to extend the rail line downtown for more than a century. Cauthen agrees that the downtown extension is long overdue. San Francisco residents voted to extend Caltrain downtown 15 years ago. It still hasn’t happened. Cauthen says that none of the last three mayors have made finishing the job a priority. In the current phase of re-planning, the city is considering several alternate routes for the Caltrain extension. Susan Gygi, an official with the planning department, says the study is necessary. It reflects current plans for high-speed rail. It also considers how each of the various possible routes could impact city traffic and services. In the study, one possibility under consideration is to move Caltrain’s 4th St. station, the current last stop, a few blocks closer to the shore of the Bay. This idea particularly irks Cauthen, who believes Mayor Ed Lee suggested this option as a way to bring Caltrain closer to the site of the new Warriors Stadium. In March, the city plans to release estimates of how much it would cost to redirect the rail line. Cauthen figures it would be at least six billion dollars, more than doubling the cost of the downtown extension project. The mayor’s press office did not respond to requests for comment. There’s one more thing that’s been casting a shadow over the downtown extension project: the Millennium Tower. The Millennium Tower is a 58-story luxury condo building right next to the Transit Center site. The foundation was built into landfill and sand. It’s sinking. And it’s tilting over two inches at the base. “You want to stay on this side,” he advises. The walls of the Millennium Tower. Crooked panels show the signs of a sinking foundation. The builders of the Millennium Tower say the construction at the Transit Center has weakened the land under the tower. The Transbay Joint Powers Authority, the agency in charge of the Transit center project, denies this. Meanwhile, a group of residents living in the tower have sued the developers of both the tower and the Transit Center. With so many uncertainties surrounding the downtown extension, the city has delayed funding twice in the past four months. Although Brown vowed to resist Trump on immigration, health care, and the environment, he said that if he and the president could “work together” on anything, it would be building transportation infrastructure. The High-Speed Rail Authority will need the help. Along with private and state investment, they’re counting on getting more federal grants to complete the rail line from LA to San Francisco. The system is estimated to cost 64.2 billion dollars. So far, the Authority’s only found funding for about a third of that. California’s high-speed rail system is the biggest infrastructure project in the state. This documentary is a deep dive into the project. We check in on what’s happening right now, what challenges the project faces, and who will be impacted by it. This is Part 2 of a four-part series about high-speed rail in California. Part 1: First Stop, Fresno. Part 2: Corn nuts and the bullet train. Part 3: Will the train be affordable?. Part 4: San Jose to San Francisco — easier said than done. Listen to the whole show: Inside High-Speed Rail. 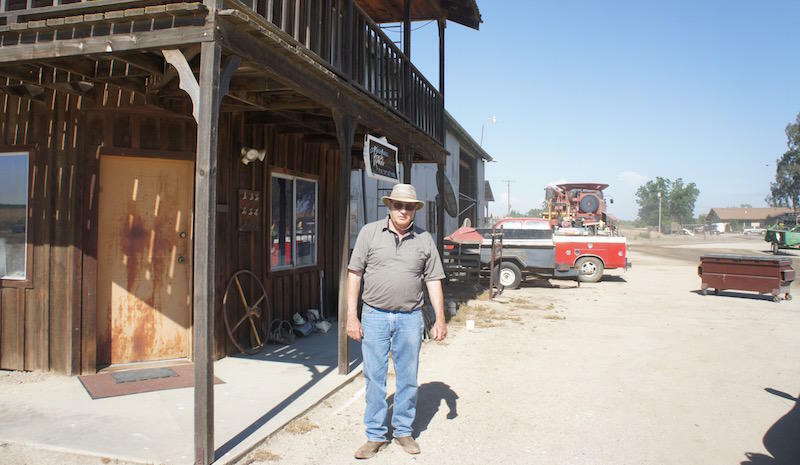 Kole Upton’s family has been farming in the Central Valley since 1946. 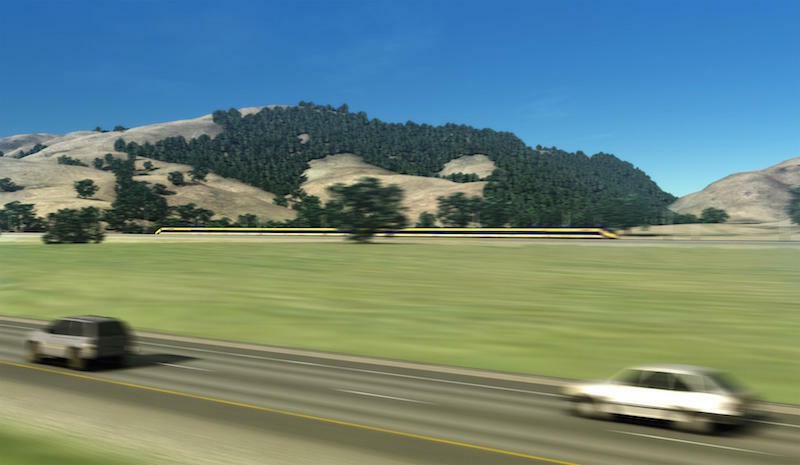 This is Part 1 of a four-part series about high-speed rail in California. Part 1: First Stop, Fresno. Part 2: Corn nuts and the bullet train. Part 3: Will the train be affordable?. Part 4: San Jose to San Francisco — easier said than done. Listen to the whole show: Inside High-Speed Rail. 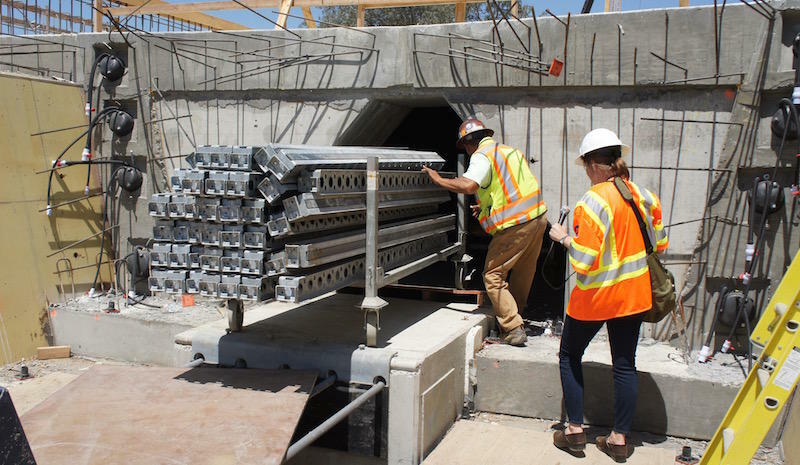 California’s high-speed rail system is the biggest infrastructure project in the state. In 2008, voters approved funding for the bullet train that would get passengers from San Francisco to Los Angeles in under three hours. This is Part of 3 a four-part series about high-speed rail in California. Part 1: First Stop, Fresno. Part 2: Corn nuts and the bullet train. Part 3: Will the train be affordable?. Part 4: San Jose to San Francisco — easier said than done. Listen to the whole show: Inside High-Speed Rail. 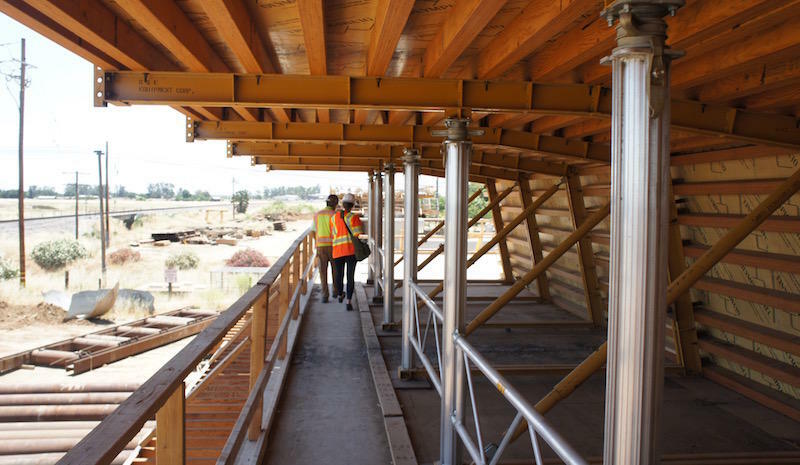 High-speed rail construction is happening right now in the Central Valley, even though the project doesn’t have all the money it needs.